I’m not really much of a jazz player, but there’s something about a nice jazz box guitar that intrigues me. 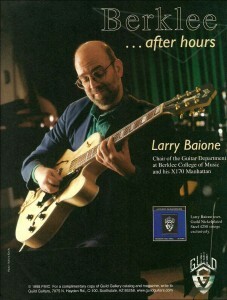 Perhaps it’s the generally high-end appointments, or maybe it’s the lure of an instrument that begs to be mastered. 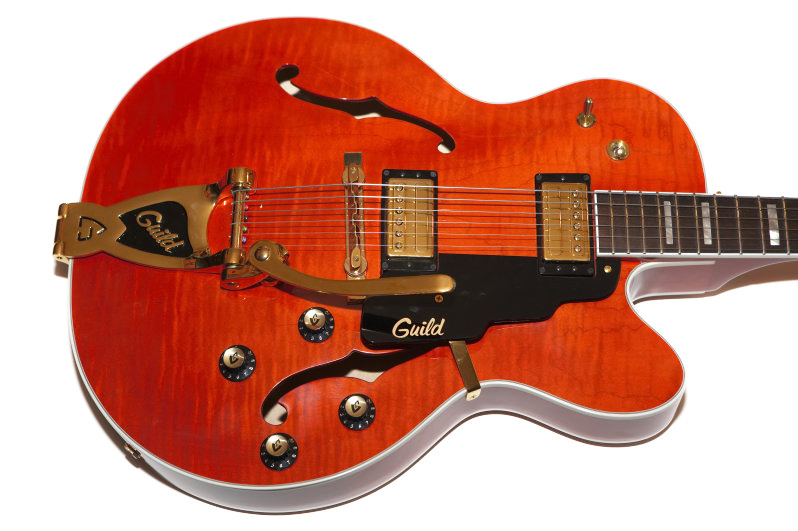 Whatever the reason, over the years I’ve found myself in possession of various Guild jazz guitars all of which have been either X-500s or X-170s. I covered a couple of 1980s X-500s in this article, and for this write-up I’ll be focusing on X-170s, all of which are from 1994 or later. I’ll spend a lot of this post reviewing this beautiful sunburst X-170 from 1994 because, well, just look at it! Guild made a guitar called the X175 from the ’50s until about 1984 when it was retired. I reviewed its 2016 reissue, the X175B (B for Blonde) in this post. The pic to the right, a 1970s sunburst X175 shows a guitar similar to the X500 in depth, bound f-holes and the inclusion of a master volume, but with more modest appointments such as block inlays, a rosewood fretboard, and silver-plated parts with the less ornate simple Guild harp tailpiece. 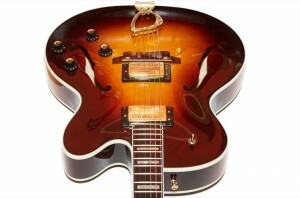 The Guild X-170 Manhattan was introduced in 1988 and was made until 2002. It is a thinner guitar at 2 1/2″ at the edge than the X-175 and X-500, both of which are full-depth jazz boxes measuring 3 3/8″ at the edge. These deeper jazz box guitars are big instruments and my X-500s weigh in at over nine pounds, especially when they include an under-bridge sound block. The X170 is a much more nimble instrument, though it’s not a lightweight like the Starfire III. Most of the X-170s I see in the wild are blonde, and my first X-170 was just such a beast. This guitar was made during the Fender era of Guild and included the less desirable Fender HB1 pickups which made it a bit woofy for my tastes. I loved the way it played, though, due largely to the larger 1 11/16″ neck found on these later Guild electric guitars. Note the difference in the bridge on the Fender-era Westerly-made X-170 (likely from 1999 or 2000) which is a tune-o-matic type on a rosewood base. My 1994 Westerly-made X-170 has an all-rosewood bridge while the bridge on my Corona-made X170T was all metal, likely due to the Bigsby and brighter tone desired for Rockabilly. 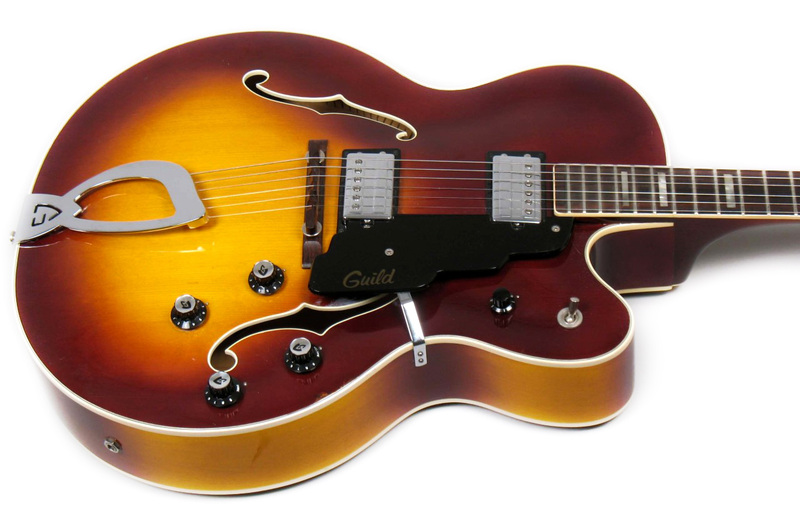 As stated, the Guild X-170 Manhattan is not a full-depth jazz box like the X-500 but it’s not a slimline guitar like a Starfire, either. 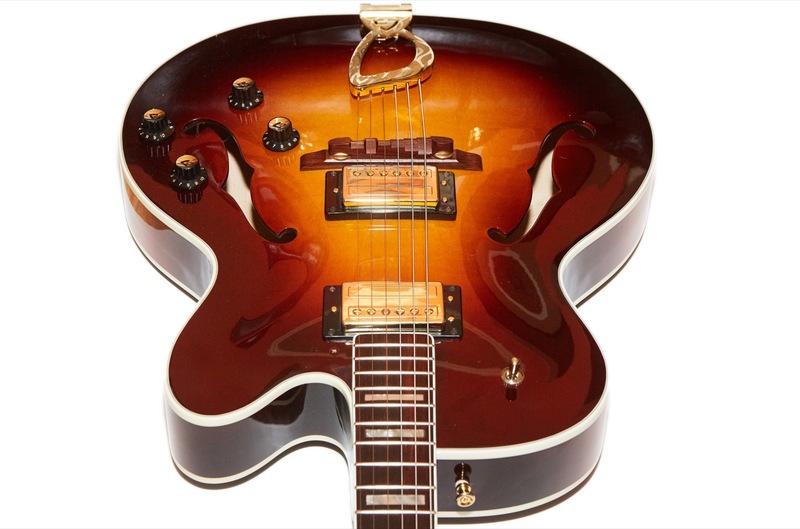 The X-170 rests right in the middle being 2 1/2″ thick at the edge which is its main design point having being advertised as more comfortable to play and hold over the thicker X-500 and other more traditionally sized jazz guitars. The X-170 has less of the high-end features found on guitars like the X-500s and X-700s though it’s generally a step up from the regular Starfires when it comes to things like inlays and hardware plating. It’s tempting to say that the X170 is a straight-up jazz guitar, and that’s all well and good until you come across a Guild X170T in Tennessee Orange. The “T” in the model number means “tremolo” which is a throwback to the epic misuse of the term by Leo Fender back in the ’50s when he confused it with “vibrato” resulting in decades of semantic abuse by guitarists the world over. I’ve owned three different X-170s over the years, the first being a 2001 blonde, the second a 2001 MARS X-170T, and the last being the beautiful 1994 sunburst model shown on the majority of this page. The X-170T was released in Blonde, but probably the most common version of the X-170T I see for sale is the MARS model shown to the right. 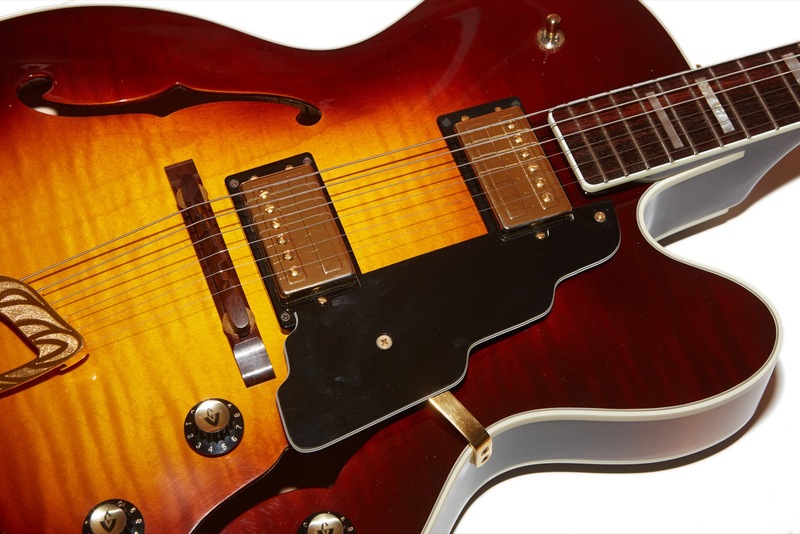 Built as a limited run for MARS music in the early 2000s, this guitar included a coil-split switch that increased tonal versatility by allowing a single coil sound in addition to the regular humbucker tones. Unfortunately, in my opinion, this guitar was hampered by the Fender HB1 pickups in use by Guild at the time which is a shame because it was an otherwise fabulous guitar. The rest of this post will focus on the beautiful sunburst X-170 from 1994 because of the ones I’ve owned, that’s the one that’s perfect for me. Well, almost perfect. Read on. This guitar is positively stunning in any light due not only to the impeccable finish, but to the color of that finish. 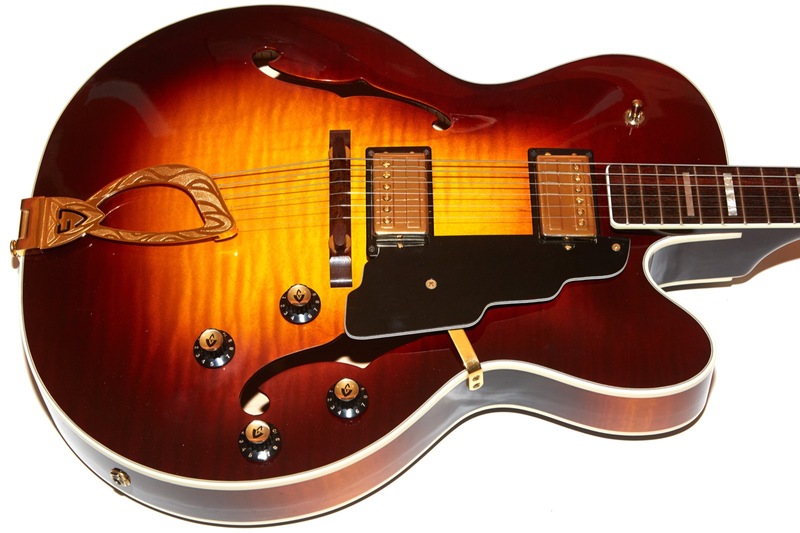 Most Guild sunburst guitars I’ve come across have more of a tobacco burst finish that is not my favorite look for a guitar. I tend to favor a more Brockburst reddish hue to my sunburst guitars and this guitar delivers the goods with aplomb. There isn’t an imperfection anywhere on this guitar, and I must say that the same was true of both of the other X-170s I’ve owned as well. Is it lacquer or poly? The way I see it, if it doesn’t distract me from playing and I can’t really tell, does it really matter? I think this guitar has a lacquer finish. It doesn’t feel candy-coated like some of my known poly guitars, but it also doesn’t have any dings, and finish checking, or any of the other signs of wear commonly exhibited on lacquer guitars, probably because it was so well cared for. So far that I’m aware, the standard colors for X170s were blonde, sunburst, and sometimes Tennessee Orange. This is the only X170 I’ve seen with this beautiful red sunburst finish. I usually only see this finish on late-80s to mid-90s Guilds but of course that’s no indication of anything other than me noticing patterns on the thousands of guitar-for-sale ads I peruse. I bought this guitar for a couple of reasons. First, the reddish sunburst finish is possibly my favorite finish on any guitar I’ve ever seen. Second, this is a 1994 Guild and based on previous experience I expected that this would have the last of the vintage Guild HB1 pickups (it does), and finally since I had bought a Starfire from 1994 that had a 1 11/16″ neck, I had hoped that this one would as well. Sadly, the neck on this guitar is 1 5/8″ at the nut, though all my other hopes were fulfilled. That was almost a crushing blow for me because the guitar is absolute perfection in every other way. Alas, I was born with large hands and must suffer the abject misery of a perfect guitar with an almost perfect fretboard. The struggle may be too much for to bear but I will seek solace by replying to the many comments by readers devoid of the hyperbole discrimination gene. The fretboard is rosewood and while I normally prefer very plain dark rosewood, this guitar has a faint streak in it that so perfectly matches the finish that I think it really ads to the overall look of the instrument. The fretboard is bound and the inlays are simple blocks that add a bit of class without being over the top. Like most Guilds, this is an incredibly well-made instrument that feels very solid in the hand. The only place I see even a hint of anything other than perfection is the pickup routes as seen from inside the guitar, and let’s be honest, who cares what the pickup routes look like from inside the guitar? I’m the guy that takes pictures of the insides of guitars and even I don’t care, though I’ll admit to being surprised at the rough edges since I’ve seen so many professionally smoothed edges on pickup routes that it came as a shock to see these in such a nice guitar. The neck joint on this guitar is absolute perfection with no seems, bumps, or any other signs of shenanigans. This guitar does have a wide sound block underneath the bridge, as did all of the other Guild X170s I’ve owned. 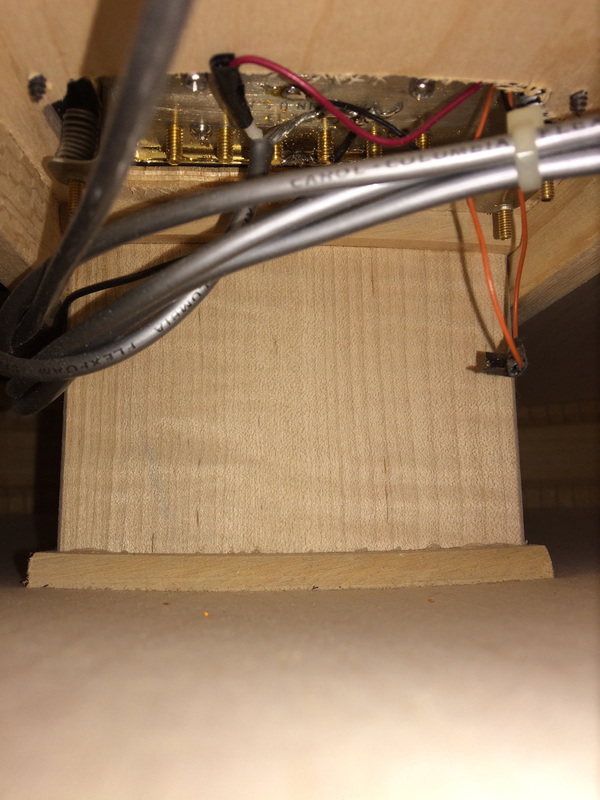 The sound block helps to deaden feedback while also adding structural integrity to the guitar. If you read my post about my 1980s Guid X500s, then you saw the large block in one of those guitars. The block in the X170s is smaller no doubt due to the fact that the guitar body is thinner. As a result, this guitar is much lighter than either of those X500s. This X170 weighs in at 7 lbs 6 oz which makes it a full pound lighter than my fully hollow X500 and almost two pounds lighter than the X500 with the sound block! Again, this guitar is designed to be a lighter and more comfortable alternative to the big jazz guitars, and it is absolutely that. The pic of the sound block was taken by cramming my iPhone into the neck pickup route. This block is a bit thinner than the ones found in the X500s, but the guitar is smaller, so a larger block is not needed. In this pic you can see the rough edges of the pickup route that I wrote about earlier. Again, you can’t see this from the outside of the guitar with the pickups installed and it doesn’t affect the playability at all. It’s just one of those nit-picky things that a guy with severe attention to detail disease notices. This guitar is fully laminate, and the top has subtle grain that comes and goes depending on the light. The flash from my camera tends to accentuate flame given the right angle, and as you can see in the pics, at some angles the flame seems to disappear altogether. My Blonde X170 was a flame monster but this one is a bit more subdued which I think works well with the finish. 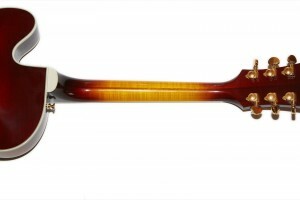 X-170s have binding on the neck and the body (front and back), but not on the f-holes. The binding is simple and is not of the decorative 5-layer type found on the fancier X500s. I think that the simpler binding adds just the right amount of elegance to the X170s. The pickups in this guitar are Guild HB1 pickups that may look different than you might expect if you pull them out. 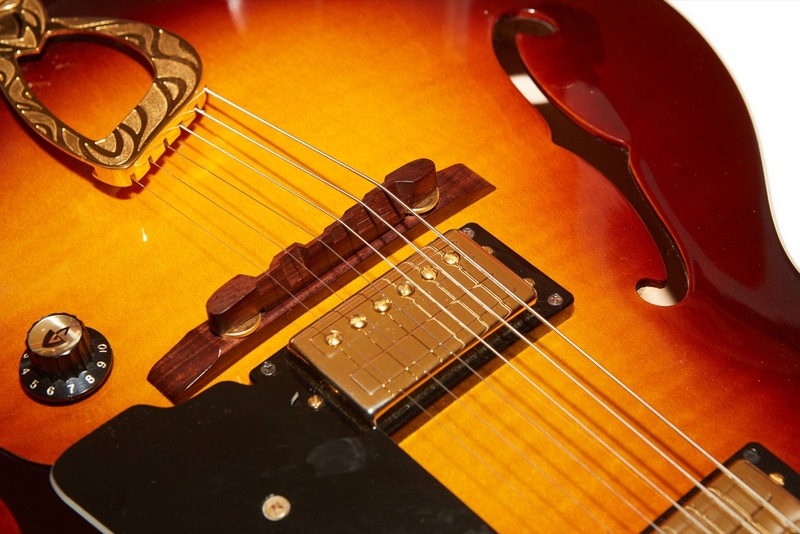 1994 was about the end of the Guild HB1 pickups, and one of the great things about these later HB1s is the fact that they have four hookup wires which means that they can be wired for inverse phase and/or coil split. Sadly, these capabilities are not being used on this guitar. This guitar has a very bright sound which surprised me when I first plugged it in. 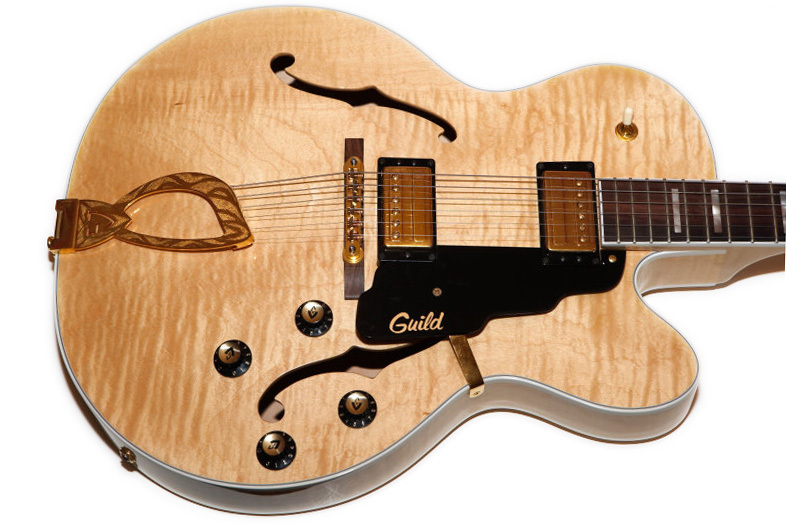 While Guild HB1s tend to be bright pickups, the thick hollow body of the guitar tends to accentuate the lower frequencies. Since my first two X170s had the Fender HB1 pickups that I disliked due to them being muddy, I was hoping for a more balanced sound with this guitar and pickup combination. I was floored at how great of a combination they make! The bridge pickup will rock with the best solid-body and the neck pickup delivers all the smooth woody character of the guitar. I swear it sounds as good (if not better) than my ’80s X500s. There is something special about this guitar. I’ve owned a lot of guitars and I’ve owned a lot of Guilds, and to my ears this one produces tones in the top 1% of them all. Why? This may be the only electric guitar I’ve owned where the tone controls don’t turn the guitar into a muddy mess as soon as you touch them. This is one of the only guitars I’ve ever played where the tone knobs make useful sounds. To my ears, most guitars have two settings on the tone knobs: good, and mud, with varying degrees of mud ranging from the 1-9 settings. As a result, I never use the tone setting on my guitars instead favoring the usually more versatile settings on the amp. This guitar, though, ranges from mellow to almost too bright while never sounding brittle. The only time I hear “mud” is when the tone knob is at zero. The range of tone is sublime, and I don’t know why. I hate a mystery, so the engineering part of my brain may need to pull all of the electronics to see if something is different. Does it have 1K pots? Different tapers? Does it have a different circuit installed? Are the HB1s somehow even lower wind than normal? I need to know, but right now the guitar sounds so damn good and I just put new strings on it so I’m not going through the pain of dismantling a hollow body guitar. I might just have to buy a bore scope to see if I can discover any secrets without having to tear it apart. Or, you know, just play it instead. The hardware is all gold on Guild X170s, and though Guild is famous for gold hardware that wears off just by looking at it too hard, the gold on this guitar is all intact, reinforcing the idea that it sat largely unplayed since it was built. 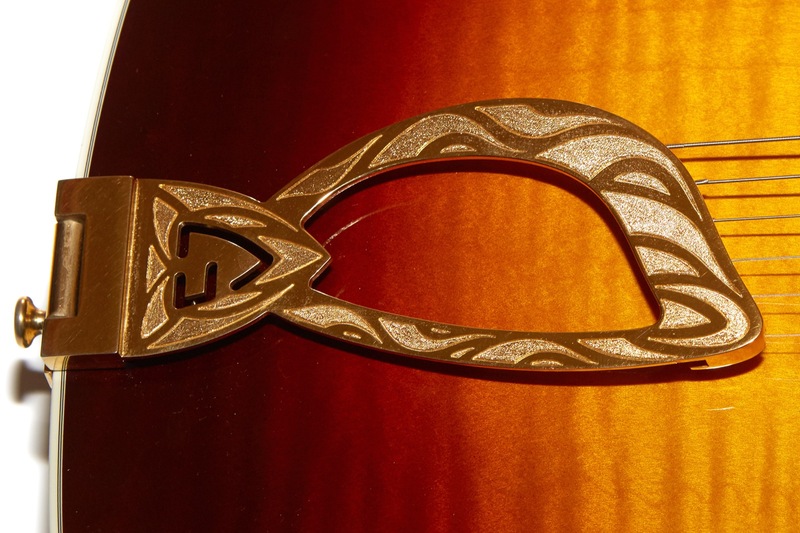 Probably the biggest piece of “bling” on an X170 is the elaborate harp tailpiece which adds just the right amount of class to this guitar, especially given the beautiful red-tinged sunburst finish. The tuners are Grovers, typical of this era of Guild electrics, and they too have no gold missing from them. This guitar could easily have been sold to me as new old stock and I would have believe it. The strap pegs are typical screw-in pegs and are nothing special aside from the fact that they have no wear evident. The bridge appears to be made from rosewood and is compensated with the only adjustment being height via two thumbwheels. 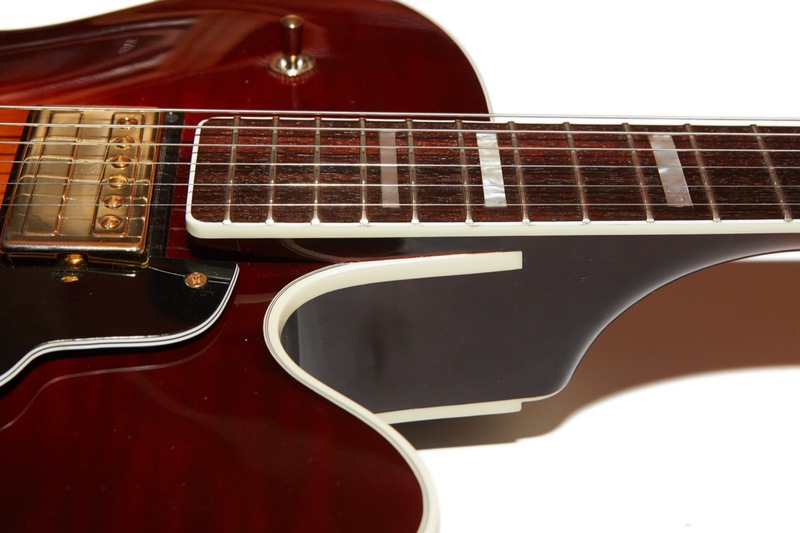 Of course, you can always adjust intonation on a guitar like this by simply moving the bridge since it “floats” on the top which simply means that it is not pinned or attached in any way. Normally I find wooden bridges to be a bit dark since I’m used to metal bridges, but this is one of the brightest guitars I’ve ever owned for reasons that I can’t quite quantify. I’ve mentioned that already in the electronics section and I’ll cover that more in the Sound section where you can hear for yourself what I mean. The pick guard is a rather plain affair, also typical of mid-90s Guild electrics with the annoying design quality of laying on top of the pickup rings. On Starfires this bothers me so much that I pull the pick guard right off, but on this guitar it doesn’t seem to get in my way. 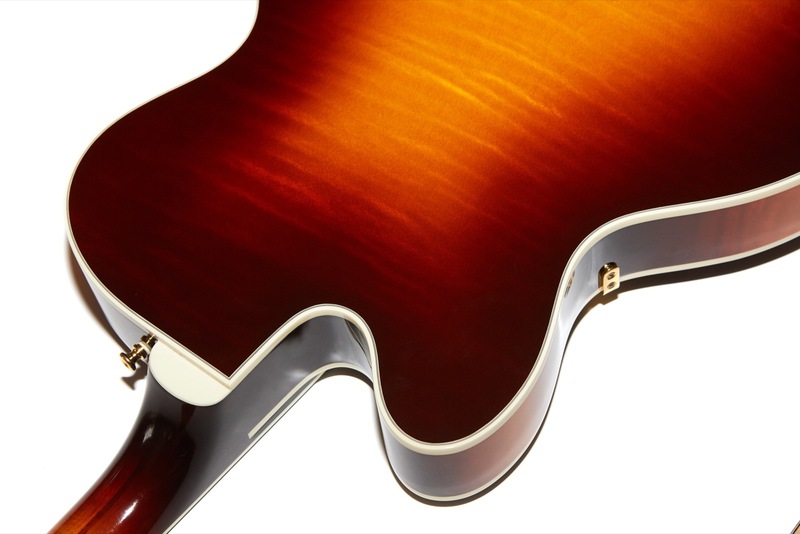 I imagine that this may have something to do with the design geometry of the guitar, but when it comes to pick guards my first rule is, “if it’s in the way, take it off.” The second rule is, “if it’s ugly, take it off.” The pick guard on this X170 has not offended me by way of either usability or aesthetics so it has remained on except when I took pictures because the top is just so damn beautiful that it’s a shame to hide it with a slab of black plastic. This is a very bright guitar, but the tone controls are so useable that it’s an amazingly versatile instrument as well. Unfortunately, I don’t feel that I was able to truly capture the nuance and complexity of the tone that the guitar produces and I’m not sure why. It could be that the differences are subtle, or that there’s something else going on that I haven’t yet figured out, but differences that sound huge to me in the room don’t seem to translate to the recordings. Still, the recordings are here and I encourage you to listen for yourself. 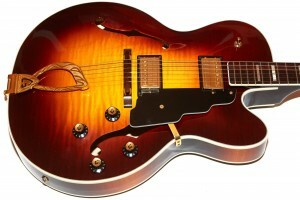 I had a 1991 X170 with the same sunburst of reds and browns a magnificent guitar, which I sold last year. While it was a great guitar in finish quality and construction I couldn’t get around the sound post dampening effect. I appreciate it limits feedback and I could never get it to feedback short of complete recklessness. The reason I ended up parting with it was I really had my heart set on a starfire. So this is a good new story I found a candy apple starfire III from 2004 and while it is technically a fender era (some call reissue) I have found it to be excellent in all manner. These are first rate guitars. Enjoy your Guilds and keep writing there are some really important differences and details you are providing. The Corona-made Starfires are still the same great guitars as the Westerly models IMO. I’ve owned many of both and aside from the subtle difference only someone like me would notice, I probably wouldn’t be able to tell them apart blindfolded, with the only exception being the pickups. You can see the difference in these two posts: 1998 Starfire and 2000 Starfire. 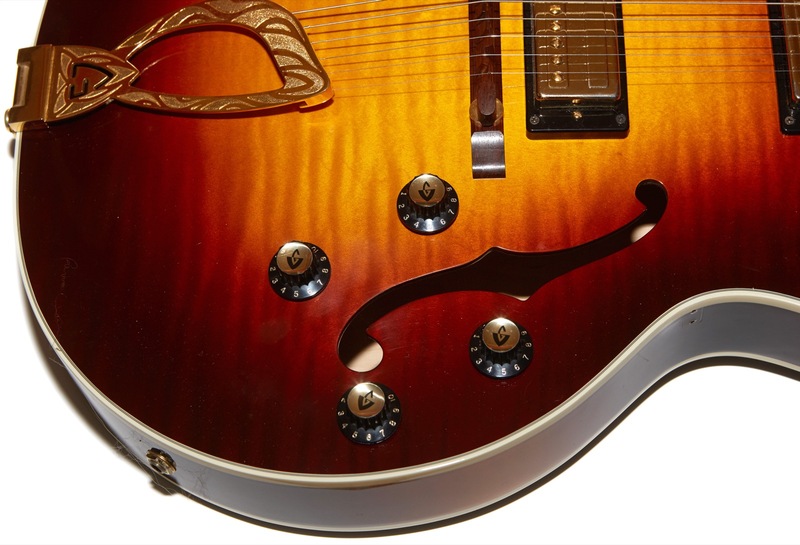 Wondering what knowledge you might be able to share regarding wound versus unwound G string on a 1997 X-170 which has a floating wood bridge with 2 thumb-wheel style height adjusters ?? I am wondering if this model might ever have been setup and shipped from the factory with an UN-wound G string ?? 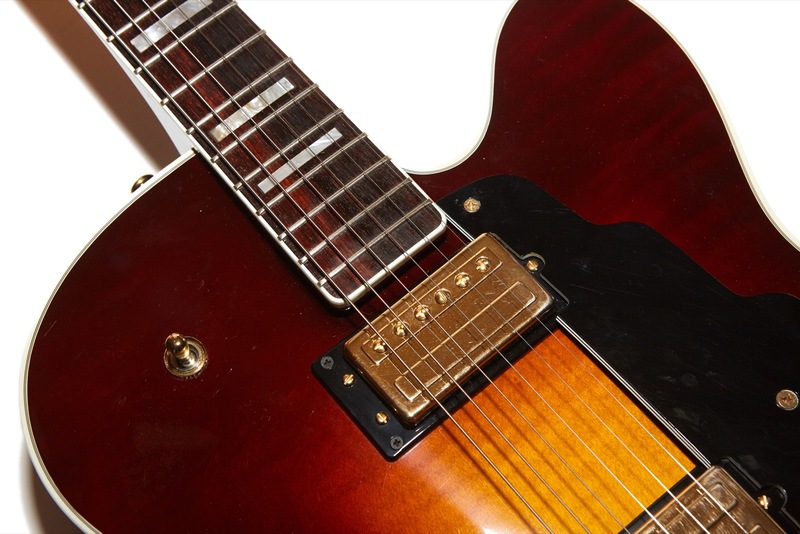 Since this has wood bridge rather than a metal tune-o-matic type of bridge would it not be a simple matter to simply swap out the current Un-wound with a seemingly more conventional Wound string to accommodate a players personal preference and/or playing style ?? 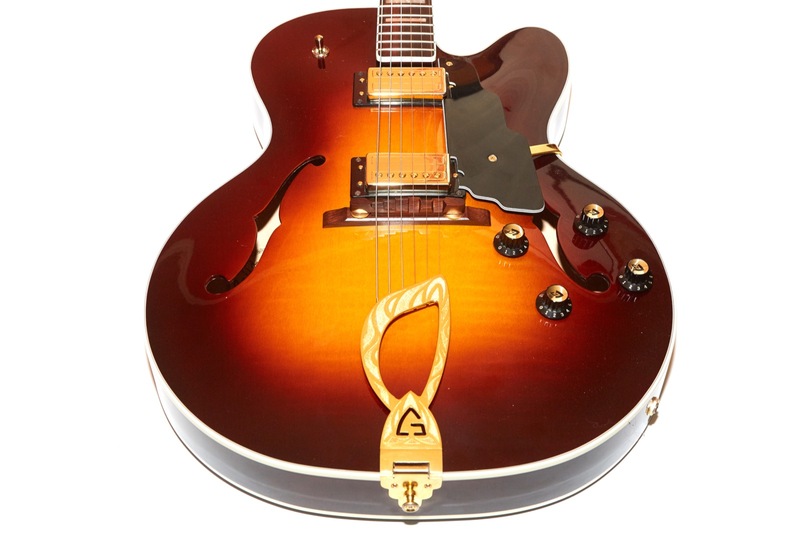 Or would swapping G string back and forth require modification of notch depth and/or replacing wood saddle (or even the neck nut) completely due to possible intonation or buzzing problems ?? Any reason not to simply swap out the Un-wound to a Wound just to observe how that might work out ?? Highly Appreciate your thoughts or opinion regarding this concern !! Yes, it’s likely that your X170 left the factory set up for a wound 3rd and I don’t think I’ve seen an X170 with a plain 3rd wooden bridge. Many of the X170Ts, however, came with plain 3rd bridges, so they do exist, but the bridges on the X170Ts are metal so they will alter the tone of the guitar a great deal. For a perfect setup, yes, you’d want to have the nut and bridge cut (or replaced) to the perfect string gauge, but for a quick test it certainly wouldn’t hurt anything, IMO. Hi, great article on this amazing instrument! I’ve owned a X170 since 1995 and have only good things to say about it. Mine has a particular issue that I’d never looked for an explanation: it has two different serial numbers! The one behind the headstock says AK170085 and the one in the table inside the instrument says AK170086. Don’t know why, but I had never cared about this. I had picked it used from the wall at the store, played it for a week or so during a lot of visits on the store, compared it to other guitars and bought it, because I felt it was the best instrument for me at this point. Serial numbers aside, I’m having trouble this days to find replacement parts for it. I need to get a new bridge and nut for it and wish to know if is there any place that sells original parts? Or if is there some place that made good new parts? Also, what is the wrench size for the truss rod? Thanks and once again congratulations for the article! THE place to go for Guild parts is Hans Moust at http://www.guitarchives.nl/guitarsgalore/. I would also ask Hans about the serial numbers as he wrote the book on Guilds (literally) and would likely know the answer. A great guitar. Your post about Polara made me bring out mine from the closet and now I got inspired to start using my -98 X-170 too. It’s sunburst but not quite as red as your beautiful guitar, more brown/yellow but still nice.